Exclusive formula developed by Honda R&D. Specifically designed for us in aluminum engines. Uses high-tech organic corrosion inhibitors that won't gel and cause radiator plugging. Original equipment on several 2003 and later motorcycle models. Single-application hypoid gear oil SAE 80W90. 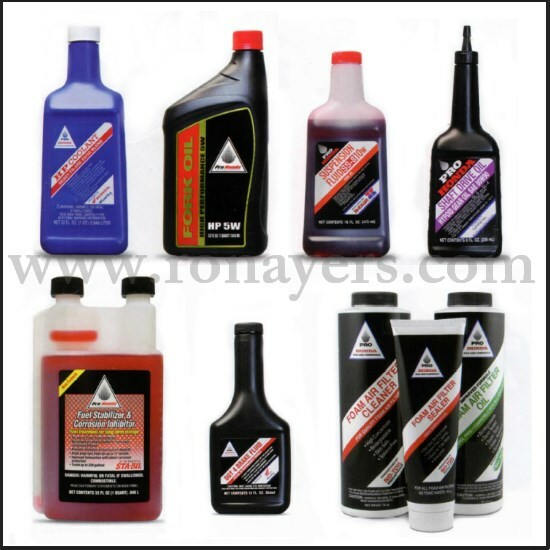 Approved for use in Honda Gold Wings and other shaft-drive motorcycles and ATV's. Exceeds API service classifications GL-4 and GL-5. Genuine Sta-Bil formula eliminates the need to drain fuel for engines stored longer than 60 days. Prevents rust, corrosion, and fuel deposits. High-Temperature formula for heavy-duty or racing applications. Designed for us in all hydraulic brake and clutch systems requiring DOT 3 or DOT 4. Eliminates the need for toxic chemicals when servicing air filters. Pro Honda biodegradable filter oil is super tacky, trapping more dirt and flowing more air than conventional oils.